Today’s Photo Friday is catching you up on our Vegas trip, books I’ve read, extreme weather and just life in general. Last week Joel’s company had their annual retreat in Vegas so we were there Monday through Thursday. It’s usually a 4 day weekend rather than during the week so it was a little different this year but hey, I’ll take a 4 day break anyway you give it to me. Joel had to work each day until 6 or 7 so we didn’t get to spend as much time together so I spent a lot of time with my girls that came along with their husbands. They worked, we played. I like the sounds of that. I spent time at the pool, shopping, walking around the strip, reading some great books and eating lots of delicious food of course. 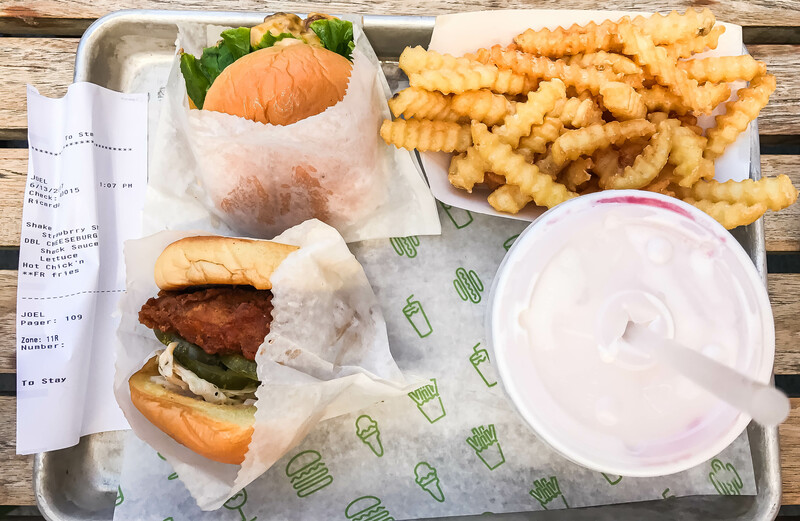 We hit Shake Shack for lunch one day and it was everything I dreamed it would be. Joel had been before but I was a first timer. I completely planned on having a burger since that’s what they are known for but then I saw they had a limited time hot chicken sandwich. I cannot resist a spicy chicken sandwich guys. It was piled with pickles and coleslaw and was perfection. I tried Joel’s burger so I could say I tried one and it was great too. We shared a strawberry shake and well, I regretted the sharing part. Our 9th anniversary was the week before our trip but we didn’t get a chance to celebrate since Noah has baseball so we decided to while we were in Vegas. We had dinner at Buddy V’s (Buddy Valastro, The Cake Boss’ restaurant) and it was incredible. The best carbonara of my life people. I started with a Caesar salad which had warm polenta croutons. POLENTA CROUTONS. They may be life changing. And of course we couldn’t leave the Cake Boss’ place without a little dessert, right? We shared a cannoli. The creamy filling, the crunchy shells, the sweet chocolate chips and pistachios all combined to create the ultimate dessert. Joel’s company rents out Moon Nightclub for the company party and here we are on the rooftop balcony. We clean up pretty nice. On the plane and while lounging by the pool I read and loved The Color of Our Sky. It’s sad, eye opening and emotional throughout which wasn’t the greatest choice for a vacation read but I definitely recommend it. I also started and finished Is Everyone Hanging Out Without Me (And Other Concerns) this week. It was a fun, light, quick read. The day after we got home my hometown got hit by an EF-1 and an EF-2 tornado. My parents, brother and close friends live there and it was terrifying. There was a lot of damage to homes, schools and property but thank God nobody lost their life. The only damage my parents had was a big branch down in their backyard. Power was out for many until Wednesday. The photos people were sharing on Facebook were unbelievable. We’ve been through so many tornado warnings in our time living in Nebraska but it was so scary for two to touch down and cause so much damage. It’s been amazing to see the community come together and help wherever they can. That’s some Midwestern awesomeness right there. My in-laws visited over the weekend and we spent the day at the lake swimming and picnicking. You could see some damage from the high winds we had here too. So, it’s been a busy couple weeks around here and we’re looking forward to a relaxing week coming up.